Total Length – All fencing materials are priced by the linear foot. You can find many beautiful styles at prices starting at under $15 per foot. Bufftech post-and-rail fences can cost even less – under $6 per foot for the 2-rail design. Our prices are all-inclusive and our money-saving quotes include all panels, posts and standard caps needed for your installation. Gates and accessories are priced separately. We’ll help you create a complete materials list for every order. Height – No matter what style you select, height affects the cost per foot for materials. The taller the panels, the more materials are used in each panel. You can save by choosing a height that matches your requirements, but that is no higher than you need. Bufftech offers a wide range of styles available in heights from 3 to 8 feet. 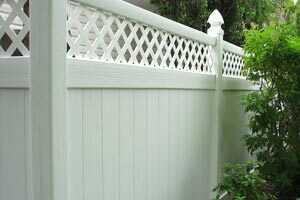 Style Choices – Bufftech offers a wide range of vinyl fencing styles. Choose from picket, semi-privacy, privacy or post-and-rail designs to match your needs and personal preferences. In each type, you’ll also find designs to suit every architectural style and color choice. Pricing varies from style to style, of course. See our style guide and to discover our money-saving low pricing for these top quality designs. Gates – Every fence needs gates, and Bufftech offers a complete range of matching gates for every style and design. These strong, beautiful gates feature internal aluminum frames and custom-designed hardware to deliver top performance at affordable cost. Ask us for our lowest prices for gates that match your design. We’ll be glad to assist you in making the right selections for shipment with your order. 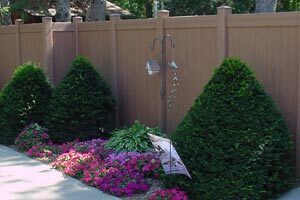 Accessories – Specialty post caps are a popular accessory for vinyl fences, and add opportunities to customize your project. From fancy vinyl caps to decorative metal and even solar powered lighted caps, we can help you add a great finishing touch at great low prices. Ask us about all options, along with color and texture choices when you call for our money-saving price quote. Our high volume purchasing power results in the maximum wholesale discounts from the manufacturer. We pass those savings along to every customer as part of our dedication to supplying the best products available at the lowest possible cost. Unlike some fence supply companies, we don’t ship from our location to you and pass along our shipping costs. Instead, we ship directly from the manufacturer to your location. You pay just one shipping cost, not two. That means fast delivery and big price savings for your supplies. Ask us about our special volume discount offers, too, on your order. For orders over $2,500, you can save an additional 3%. Don’t pay more than you should for top-quality vinyl fencing materials. Call us for our lowest price quote for the full line of Bufftech picket, privacy and post-and-rail fencing panels, boards, gates, and accessories. Our expert consultants will help you choose exactly the right products, create a complete materials list from your measurements and quote you a low, money-saving price for everything you need. You’ll save on the cost of your materials, and we’ll get your order on its way to you direct from the manufacturer. Your complete satisfaction is always our highest priority.